Curved mouthpiece with upward curve and hinge in the center. Bars are a square twist. 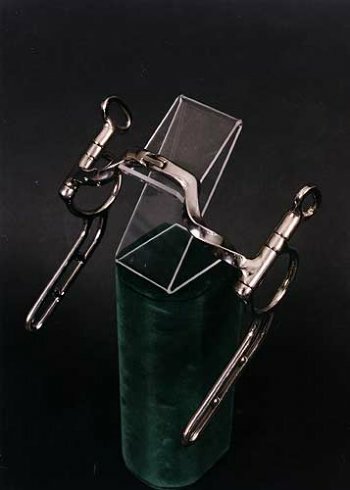 The Myler Ported Hinge mouthpiece works well with the intermediate and finished horse. This is a bit for horses that have been working in a MB 33PB in the cart and are ready for the team. It is a good bit for a horse that gets behind the bridle or have been hard mouthed historically. Good bit for a horse that is a leader horse who needs a little more authority in a multiple hitch. Must be used with light hands. This bit can be used single, team or in the multiple hitches. Also available without bushing.